Awareness of the disease is increasing and the need for diagnosis. View our education and resources. See meetings, online activities, webinars and much more! Search for jobs. Post a resume or job. Help Shape ASNC's Next 25 Years: Join ASNC's Board of Directors! 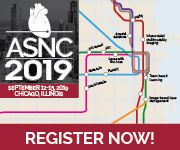 As ASNC comes off its 25th year of impactful and groundbreaking achievements in nuclear cardiology, the Society looks forward to another 25 years under the stewardship of a dynamic Board of Directors that will empower ASNC's continued growth and long-term success. Deadline to apply is this Friday, April 19. By Noel Dasgupta, MD Many physicians learned a bit about amyloidosis in medical school but never expected to diagnose or treat it. Even today, as amyloidosis becomes more visible, it can be unsettling for us even to contemplate because there are multiple types and treatments vary.